To supervise the Olympic Sports and cooperate with the State as well as with the public and private bodies for the promotion of healthy sport policies. To encourage love for sports and respect for the spirit of sportsmanship among the young. To organise in cooperation with the National Federations the Olympic preparation of athletes. To proceed, on its sole responsibility, to the final selection of athletes who will represent Greece at the Olympic and Mediterranean Games. Regarding the selection of athletes who represent Greece, the decision of the HOC with Ref. No. 40/15-12-1987, was a landmark. Following the proposal of Mr. Ioannis Papadogiannakis, the HOC decided the implementation of a coordinated programme of Olympic Preparation and set precise criteria for the athletes who would participate to the Seoul Olympic Games. For the first time are set criteria more strict that those of the International Federations. Despite the initial protests of the National Federations, the correctness of that decision was proved with the later success of the Greek athletes. The same issue had been brought up for discussion in 1978, by then HOC Secretary General, Nikos Filaretos, who had proposed a system of “5 Olympic stages” – implemented with great success by the Belgian Olympic Committee for the athletes of its Olympic preparation – based on criteria set by the International Olympic Committee. The HOC administers, manages and sees to the maintenance of its facilities under its jurisdiction such as: the Panathenaic Stadium in Athens and the Olympic Swimming Center in the centre of Athens, the neoclassical building of Kapsali Str, Kolonaki (HOC headquarters until 1998), including all facilities therein and appurtenances thereto as well as all surrounding public premises, the International Olympic Academy, the Olympic Museum in Ancient Olympia and the site of the Marathon start. The HOC is also represented on the board of directors of the Athens Olympic Sports Complex (OAKA). The HOC is also solely responsible for the Lighting and Hand over ceremonies for the Summer and Winter Olympic Games as well as for the correct interpretation and implementation of the articles of the Olympic charter. In addition, the HOC can make suggestions to the IOC regarding the Olympic movement and the organising of Olympic Games in general. The HOC is also charged with selecting the candidate city to host the Olympic or Mediterranean Games. Therefore, it submitted the candidature of the city of Athens for the Olympic Games of 1996 and the Athens 2004 Olympic Games, on the 15th of December 1995. The HOC takes action to ensure the writing, publication and distribution of special editions aiming at the development and promotion of the Olympic Idea and the history of Olympism, out-of-school physical education and sport in general; it also takes action to ensure that HOC information material and all sort of material in print be published and circulated in order to help fulfil the mission of the International Olympic Academy. Finally, the HOC recommends to the Minister responsible for sport issues and supervisor of the HOC, actions that should be taken for the achievement of its goals. (a) The Plenary Session which includes necessarily (ex-officio) the IOC members for Greece (permanent members of the HOC), the representative of the National Federations of Olympic sports, an active male athlete or former male athlete and an active female athlete or former female athlete that have participated at least one time in Olympic Games (in case a former male or female athlete is elected, he/she should have participated at least once in the last three Olympic Games prior to the day of their election) and two eminent personalities (with contribution to sports and the dissemination of the Olympic Spirit). (b) The Executive Committee which is composed by seven (7) members. By right its members are: the HOC President, the IOC members for Greece, the A’ Vice President, the Secretary General and the Treasurer. It should also be noted that the participation of the abovementioned members is realised in one of the abovementioned capacities, while the Plenary Session elects from its members the rest of the E.C. members until they reach the number of 7. 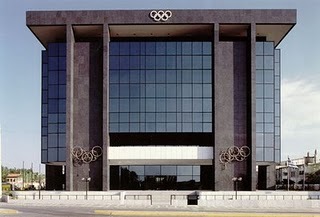 The HOC offices, as well as the International Olympic Academy’s offices are situated in Halandri, Athens, at a street, which – following HOC’s request to the Municipality of Halandri – was renamed to Dimitriou Vikela Ave. in honour of Dimitrios Vikelas, reviver of the Olympic Games and first IOC President.